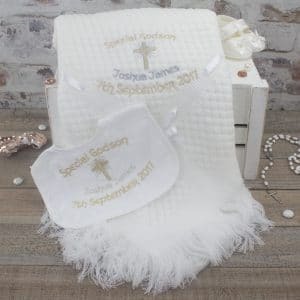 Commemorate the day baby becomes apart of the church with our stylish Personalised Christening/Baptism Shawl, a simply stunning Christening gift designed to keep baby warm in the winter & cool in the summer, coupled with the all important details of the day! Have you been lucky enough to have been asked to be a god parent? 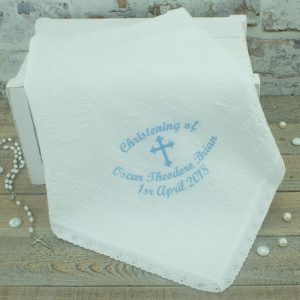 Help commemorate the day your godchild becomes apart of the church with our stylish personalised christening shawl, a perfect keepsake from their favorite godparent! Have you been lucky enough to have been asked to be a god parent? 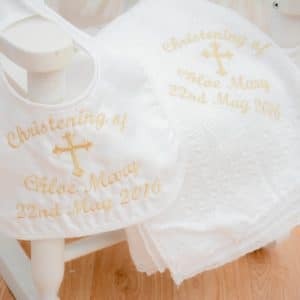 Help commemorate the day your godchild becomes apart of the church with our stylish personalised christening shawl & bib gift set, a perfect keepsake from their favorite godparent! 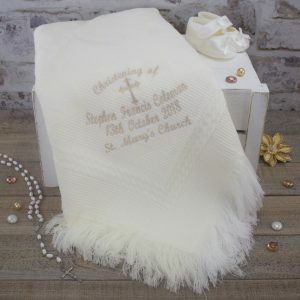 Commemorate the day baby becomes apart of the church with our stylish personalised christening/baptism shawl, a simply stunning gift designed to keep them warm in the winter & cool in the summer, coupled with the all important details of the day! 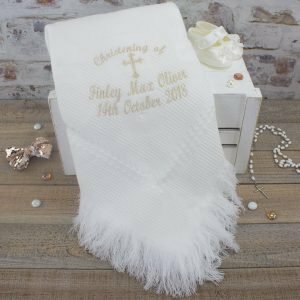 Commemorate the day baby becomes apart of the church with our stylish personalised Milano Style christening/baptism shawl, a simply stunning gift designed to keep them warm in the winter & cool in the summer, coupled with the all important details of the day!